2 weeks to go, and another competition! So yesterday was my longest run ever, and today marked the start of TAPER… I can’t believe that this time in two weeks I will have run the London Marathon! Where has the time gone? I remember the day that I got the magazine telling me I was in. I was so excited and jumped around the house like I was a kid again at Christmas! No one was home, so I had to ring my mum to tell her. I can’t believe it is now only 2 weeks away. Training has been going well, and last week i nailed all 4 runs, finishing with my longest run EVER! Monday was a nice 3 mile easy run, and then Tuesday was speed work. I didn’t know how my speed work would be, as Tuesday was my fourth day in a row – I’m not sure I have ever done that before! I set my Garmin to buzz to tell me when to run fast etc, but didn’t really look at it! 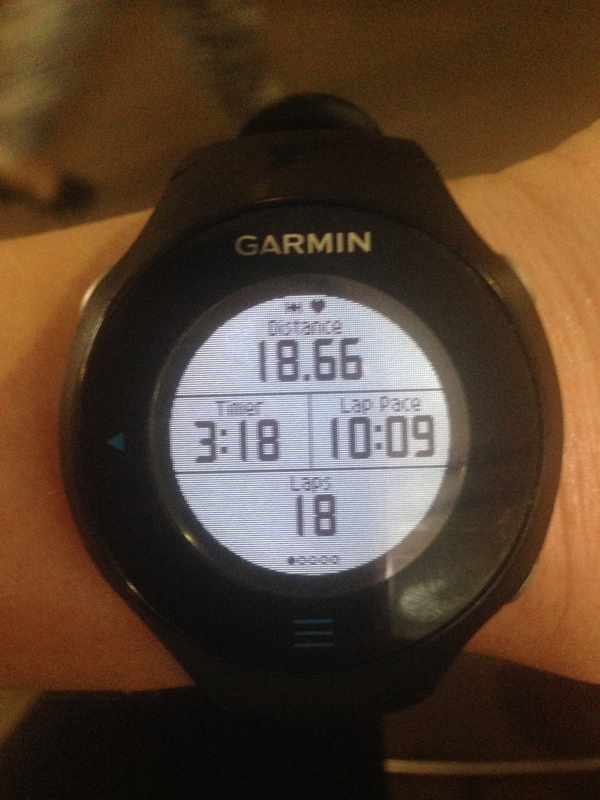 I was so pleased when I got home and looked at the splits – all 3 minute fast paced sections were around 8.15mm pace. How amazing would it be to be able to run that fast for longer than 3 minutes!! Thursdays run was much tougher to fit in, as I had a full day at work, and then a parents evening after that. By the time I got home, my motivation was really lacking! Luckily a friend of mine said that she would come out for 3 miles! Once we had completed the three miles, I was out so I just went on to finish the rest. I was so pleased when I finished them – you never regret a run! Sunday, I needed to complete my LONG long run! I was booked on the Brooklands Half Marathon, but I knew that I needed to go further than 13.1 miles. I had to get up early to run additional miles before the race started! The clocks going forward did not help! I set my alarm for 5AM for breakfast!! The things you do for marathon training! I managed 5 miles before the race. I arrived at the race 15 minutes before it started, walked straight the the start, and before I knew it we were off. I was so lucky that I got chatting to one of the Run Mummy Run ladies that was also running, and we ran and chatted the entire thing together! The 13 miles just flew past. When I finished my Garmin read 18.2 miles. I really wanted to get to 20, but once I picked up my goody bag, I tried running with it, but it just wasn’t comfortable. So I just ran straight to my gym. The positive that I took from this, was I felt that I could have kept going! So now to taper. I am very much looking forward to this! Now I can turn my attention to raising more funds and awareness for The Motor Neurone Disease Association. My current total stands at £2711.56 and I am desperate to get to £3000. I have been so lucky with the support I have had from Lexie Sport. They offered to give me a pair of Veronica Shorts to raffle off. Unfortunately, I didn’t get the support I had hoped for with this. The shorts are lovely, but I do think that you have to have a certain body shape to wear them. 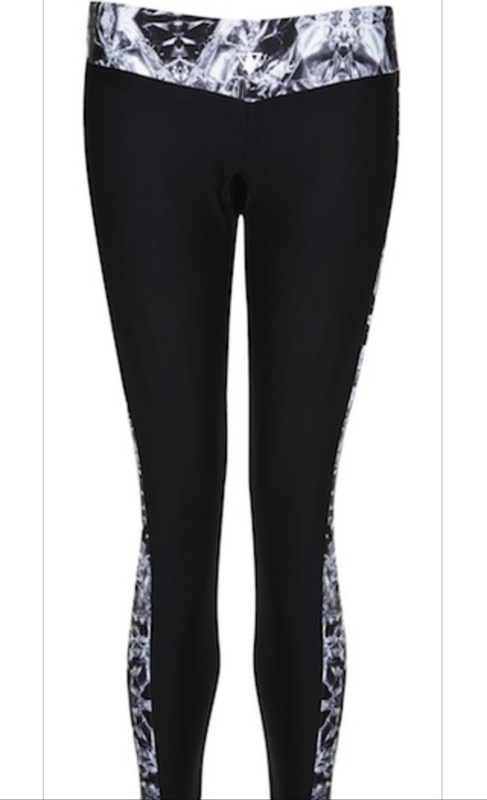 So, Lexie sport have said that I can change the item to a pair of their Lake Leggings. These leggings are low-key in design, but also display a quick flash or the unique blonde print down the side and around the waistband. They cost £65.00 but you have the chance to win them. I am running a raffle type entry, in which if you donate to my just giving page, and in the comment box you put the words Lexie Sport, I will put all the names in to a hat to draw a winner. 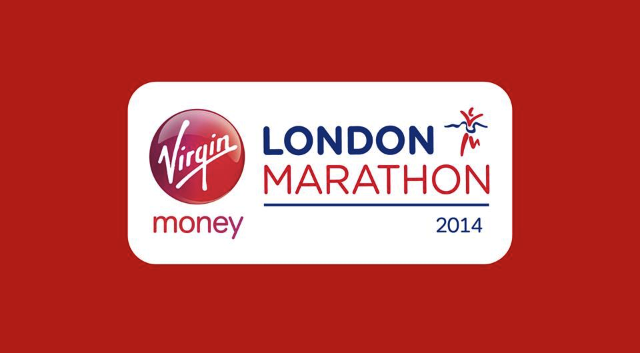 You can donate as little as £1 to be entered. You will need to leave your twitter name or email address, so that I can contact the winner. My just giving page is www.justgiving.com/dennismurphy1949. I will do the draw on Monday 14th April 2014.Please retweet and share this blog so that everyone gets a chance to win these leggings. Let the fundraising begin. For a £1 donation you could be in with a chance of winning a pair of leggings worth £65.00! I think that’s worth donating, as well as the added bonus that your money will be going towards an amazing charity that is working hard to give families a hope.